Venturing into an uncharted, dark, and dripping cave, with no tools but a flickering candle, an old service revolver and a ball of string, sounds like a perfect adventure as far as Ashford Price is concerned. It doesn't get much better as far as he is concerned. 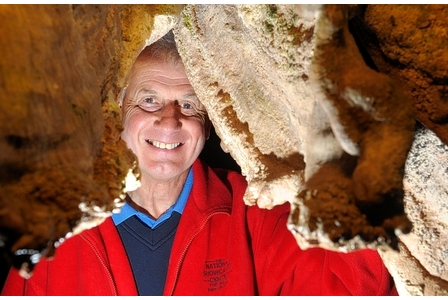 As the man very much at the helm of Abercrave's National Showcaves Centre in the Upper Swansea Valley steering it towards the success story it is today, he remains in awe of his intrepid ancestors, and their voyages of discovery into the unknown, underground. "I am a bit envious of them, yes," he says. "When you read their diaries and you imagine what it must have been like to venture into what was at the time, the complete unknown. "In fact their diaries show that one of the brothers took his old service revolver down with him, because he didn't know what they would find when they got there." The brothers were farmers who were trying to find out where the water was coming from on their land, because it was important for the farm. And they stumbled across the first cave, Dan Yr Ogof, by accident. "This was the earliest form of caving," says Ashford, "with no special equipment, just a flickering candle to guide them over very rough ground. Can you imagine? They just used a ball of string to help them find their way back and they marked arrows in the sand so they didn't lose their way." What they found was an 800m long cave, though it links up with a whole cave system of more than 10km beyond. These days the site is a sophisticated affair with the Dan-yr-Ogof showcave, an Iron Age farm, a cathedral showcave, with waterfalls and eye-catching rock formations, a dinosaur park a shire horse centre and more pulling in upwards of 80,000 visitors every year. The Morgans, says Ashford, realised the potential of their find straight away. "At the time of course there was a great and a growing interest in natural history and people were starting to look beyond their natural environment and their immediate area. And going underground was a new frontier. "So visitors came in very large numbers to go down in the caves, wading in, waist deep in water, in freezing conditions. Women used to tie their skirts at their knees and wade in." When the site marks the 100-year milestone in June, visitors might not have to brave the icy waters, but there are plans to stage reenactments of the journeys of the Morgan Brothers, using the coracles and the meagre tools they would have used back then. Further explorations at the farm unearthed what is now called the Bone Cave, with evidence of Bronze Age inhabitants having made it a shelter and a home — more than 40 human skeletons have been found there. The site is also home to dinosaur bones and giant dinosaur models pull in the crowds. While the voyages of archeological discovery might be over at the attraction, nothing stands still. And the emphasis is on the future as much as on the past, says Ashford. "We are probably the most environmentally friendly and energy efficient tourist attraction in Wales, with a hydroelectricity scheme that uses the water that is found here naturally. So while we used to have 180 tonnes of emissions we now have nil. We have electricity points here for electric cars and we have planted 80,000 broad leaf trees in an effort to attract birds of prey back to the area. We now have red kites here." Though green schemes might be the future for the UK as a whole, it is vital, says Ashford, that minds are concentrated on offering concrete attractions and draws, not just vague, if pretty, open spaces to pull in punters. Ashford has been vocal in the past and he continues to be vocal on the subject of Wales as a tourist destination. "I think getting rid of the Wales Tourist Board was a mistake. And replacing it with civil servants and with Welsh Government bureaucracy in an industry where decisions have to be taken very quickly, is a mistake. "When we have had big events like foot and mouth and when we have heavy weather conditions which we have to cope with we have to react to those things very fast and that isn't in the nature of officialdom. I just hope that if the Welsh Government realises things have to change they take the necessary steps to do make it happen before the situation gets worse. The percentage of people who are visiting Wales since the demise of the tourist board is down by something like 12 per cent, and we can't afford to allow that decline to continue." His own children Sarah and James already shoulder some of the responsibilities at the Abercrave attraction, and Ashford is proud of its longevity and hopeful for its future. "I have been here for 45 years now," he adds. "I have grown up with it and I have loved every day of my working life. My children are very enthusiastic about it and it is very much a family business. "Tourism is going to become more important to the prosperity of Wales in the future and it is important to get things sorted out now, for the sake of the youngsters, and so young farmers are able to diversify into other farm based businesses in the future. At 100 years we have lasted a lot longer than many and I hope we will continue to be here for many more years to come."